The global services locations landscape continued to witness stable growth in 2016 in terms of revenue; however, the growth rate was slower than the previous year owing to macroeconomic slowdown, political instabilities, and volatility in equity and investment markets. Similarly, the growth rate of center setups also dropped in 2016 in comparison to 2015. This period continued to witness a shift from traditional locations; particularly, the share of India in terms of both center set-up activity and headcount reduced in 2016 as compared to some other locations in Nearshore Europe and Asia which witnessed increase in their respective shares. This year also saw increase in delivery of IT and engineering/R&D services as compared to business process services. In terms of disruptive technologies, service providers and enterprises are increasingly focusing on delivery of digital services – there has been significant growth over the past few years. 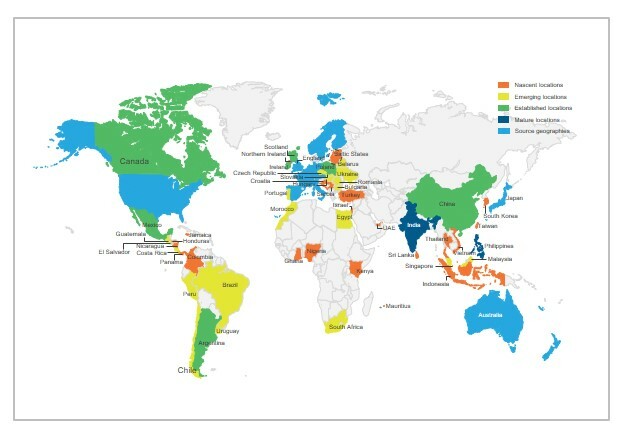 The Global Locations Annual Report 2017 is a unique and comprehensive guide to understanding the nuances of the global services locations landscape and interpreting locations-related developments and trends to frame locations strategy. It presents insights into the size and growth of the global services market, global services exports by region & country, update of locations activity by region & country, and trends affecting global locations (changes in investment environment and exposure to various risks). It also provides industry-leading comparison and analysis of key changes in maturity, arbitrage, and potential of global delivery locations (cities) through our unique MAP MatrixTM analysis. The report also provides data tables with details of new centers that were set up in 2016 for global services delivery.